The Jan Runermark Award was created at the ENS Steering Committee meeting in Dresden on 24 November 1995, in memory of Jan Runermark, the initiator and founding father of the Swedish Young Generation Network and promoter of the ENS Young Generation movement. 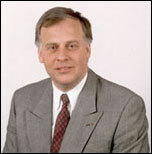 Jan Runermark, at the time President of ABB Atom and President-Elect of the European Nuclear Society, died in a tragic car accident on 25 July 1995. ENS YGN honors Jan Runermark annually by handing out Jan Runermark Award to a senior professional that have demonstrated through his/her action during their carrier that has given outstanding service, to the benefit of the young generation and young professionals and has done so in compliance with the goals defined in the YGN Terms of Reference. 2017 Jan Runermarks Award was given during the ENYGF to Luc Vanhoenacker and Jean Van Vyve fromo Belgium . The laudatio can be found here.